While Nevada launched its recreational cannabis program on July 1st, 2017, this year will be the first time that April 20th is celebrated in the state’s legal rec market. A long-standing holiday of the culture, historically April 20th is treated like the Black Friday of cannabis, even in medical marijuana markets. MEDIBLE MONDAY – APRIL 16th, 2018: Kicking off the week, medical patients can receive a free medicinally infused lozenge with any medical purchase. This promotion will run all week, through 4/20/18 at all Nevada locations. LOCAL LOVE TUESDAY – APRIL 17th, 2018: We realize locals may want to beat the influx of tourism that Friday will bring, so we’re offering 20% off on April 17th to anyone with a local Nevada ID. Stock up early at all Nevada Reef locations so you can celebrate properly on Friday! Cannot be combined with any other discounts. WAX WEDNESDAY – APRIL 18th, 2018: We’re saluting our lovers of concentrates and extracts on Wednesday with 20% off concentrates from each CannaVative, Vader, BAM, and Hyve brands at all Nevada Reef locations. TASTER’S THURSDAY – APRIL 19th, 2018: Thursday we are offering a Buy One Get One free on all CW IncrEdibles edible products at all Nevada Reef locations. Plus, you can save an additional 10% off of flower ounces from the same tier. –	8AM drop of massively popular Wedding Cake and Khalifa Kush strains at our Las Vegas Strip and North Las Vegas locations, which are expected to sell out, as well as the debut of Khalifa Kush edibles at our Las Vegas Strip location. Additionally, Wedding Cake and Khalifa Kush will be available at our Sparks and Sun Valley Nevada locations when doors open on 4/20/18. –	Debut of the limited edition, dated Reef Dispensaries Hat, free for the first 75 people in line at 8AM at our Las Vegas Strip location. The hat will also be free for first 35 people at 8AM at our North Las Vegas location, and the first 10 people in line when doors open at both Northern Nevada locations (Sparks & Sun Valley) and both Arizona locations (Phoenix & Queen Creek). Non-limited blue variants without the date will be on sale for $25. –	QualCan will offer 20% off brownie and marshmallow treat bites. – All apparel 50% off at Sun Valley and Sparks locations. All specials will be valid while supplies last. Nevada cannabis vendors will be on site at our Las Vegas Strip location all day long on 4/20/18, including VVG North (M Stick), Tsunami, Evergreen Organix, QualCan, CannaPunch, CannaHemp, Dixie, Cannavative, Deep Roots/Cheeba Chews, Nature’s Chemistry, Las Vegas Cannabis, and more. We’ll also have a Hot 97.5 FM live remote, DJ set from Presto One, as well as food trucks throughout the day. We’re pleased to announce our line-up of celebrity personalities whom will be on site to meet the fans at our Las Vegas Strip location all day on April 20th, 2018. 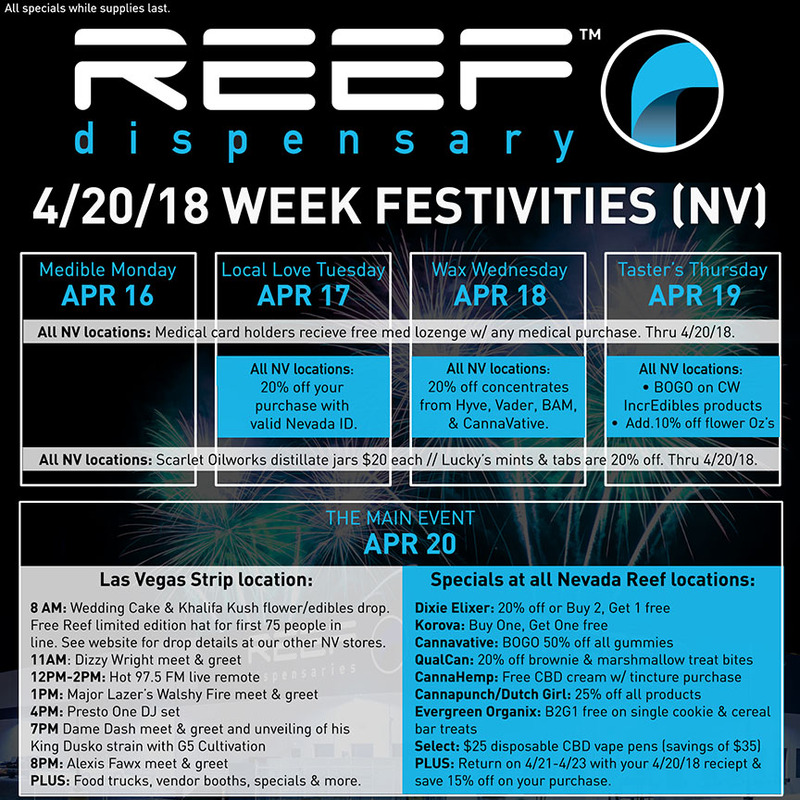 Finally, starting on April 21st, 2018, Reef Dispensary’s Sun Valley, NV location will be open until midnight! Stop in for a nightcap.